SANTA CLARA, Calif. January 6, 2019 (Momentus PR) — Momentus, provider of in-space transportation services, today announced that they are taking orders for their Vigoride and Vigoride Extended services (orbital repositioning for satellites with masses up to 250kG) and have signed their first customer: EXOLAUNCH, in a contract worth more than $6M. EXOLAUNCH (formerly ECM Launch Services), is a leading European launch services provider and cluster integrator, that will first use Vigoride in the fourth quarter of 2020 and Vigoride Extended in 2021. A graduate of the prestigious Y combinator program and based in Santa Clara, California, Momentus is currently perfecting both Vigoride and Vigoride Extended to perform last-mile delivery in space for payloads up to 250 kg. Prospective customers can download the Vigoride services datasheet to determine if Vigoride is right for their need. The Vigoride service is designed to support smallsats and cubesats in low Earth orbit. 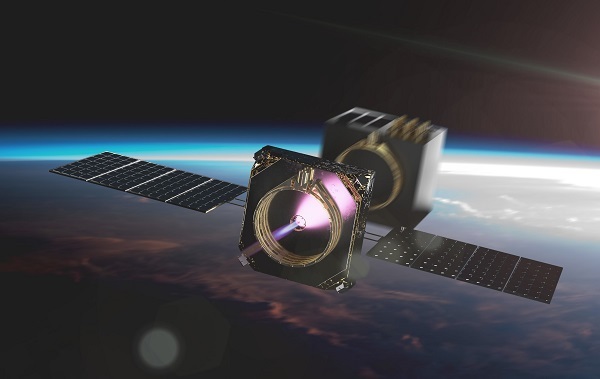 Vigoride Extended is capable of delivering smallsats throughout high and medium Earth orbits including geosynchronous orbit, Lunar orbit, and beyond. Momentus employs new and proprietary technology including water plasma engines for the mission of low cost sustainable transportation though space. Vigoride and Vigoride Extended are the first two offerings in a pipeline of planned Momentus services that will grow over time to be capable of repositioning multi-ton payloads from low Earth orbit to many different destinations, including geosynchronous orbit, the Moon, and interplanetary transfer. The first leg of a satellite’s journey will include a ride along with Vigoride on a rideshare on a large rocket, a dedicated small launch vehicle, or deployment from the International Space Station. The Vigoride transfer vehicle then carries a satellite, or constellation of satellites, through space to their final destination orbits. The Vigoride service is infinitely flexible and can deploy up to dozens of individual satellites in custom orbits as part of a single mission. Momentus provides in-space transportation services carrying satellites between various orbits and to deep space. Our water powered in-space rockets provide last mile logistics, connecting customers from where their rockets drop them off to their final destination. Our mission is to provide the most efficient in-space transportation services supplied by resources available in space. EXOLAUNCH (formerly ECM Launch Services) is a leading European launch services provider and cluster integrator offering easy, cost-effective and regular access to space for small satellites. Our proven flight heritage includes the successful organization and launch execution of 50+ international small satellites to sun-synchronous orbits, and we intend to launch over 60 more in 2019. In addition to our launch services, EXOLAUNCH designs and manufactures in-house 12U/16U CubeSat launch deployers and shock-free separation systems for micro-satellites. When combined with our launch services, this makes us a preferred partner in the NewSpace industry.